If you are a novice, it is important to learn a few basic swimming techniques so you can feel safe in the water. Learning basic swimming techniques can be fun! If you master these basic techniques first, you will feel more at ease and relaxed when you tackle the popular swimming strokes. This article gives you an overview of those basic techniques. Fear of Water can have several causes, which we discuss. The flutter kick is a simple yet effective swimming technique where your legs execute kind of a whipping motion. As a beginner you should learn to do this technique in a prone and in a supine position. You’ll be then able to use the flutter kick to tread water and to swim dog paddle. Later on, you’ll use this technique while swimming backstroke and the front crawl. The starfish float is a basic swimming technique where you float on your back with arms and legs spread apart. This article explains how to do the starfish float. As a beginner, it is also important to know the breaststroke kick, even though it’s more difficult to learn than the flutter kick. Beginners can use the breaststroke kick to tread water and to swim elementary backstroke. Later on, the breaststroke kick will be used while swimming breaststroke. Sculling water is another basic swimming technique. Basically, you float in an upright position with your head above water and with your arms extended sideways at shoulder level. You use quick sweeping movements of your arms at the water surface to stay afloat. This technique is best used in combination with a kicking movement of the feet (see below). 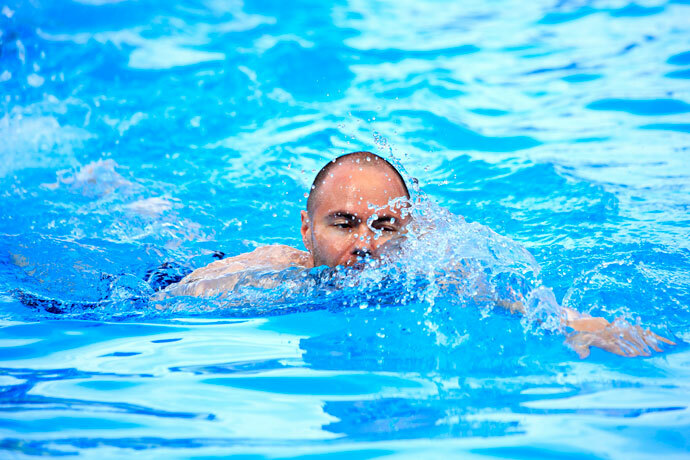 Treading water allows you to stay afloat in the same spot while keeping your head above water and your body upright. It is a very useful technique when you need to orient yourself in the water or to observe something that happens around you on land. Learning how to tread water is easy once you know how to flutter kick and how to scull water. Treading water is then simply a matter of being able to combine both swimming techniques. Dog paddle or doggy paddle is also a basic swimming technique. You float in the water in a more or less horizontal position and keep your head above the water surface and look forward. Your legs do a flutter kick and you paddle forward and downwards with your arms. From above your movements look much like those a dog would use while swimming. Elementary backstroke is a basic swim stroke that you can learn quickly once you are able to float on your back. Elementary backstroke uses an inverted breaststroke kick and simple synchronous movements of the arms for propulsion. I suggest you spend some time learning the basic swimming techniques listed above. Once you have those under your belt, you will be well prepared to tackle the most popular swimming strokes. 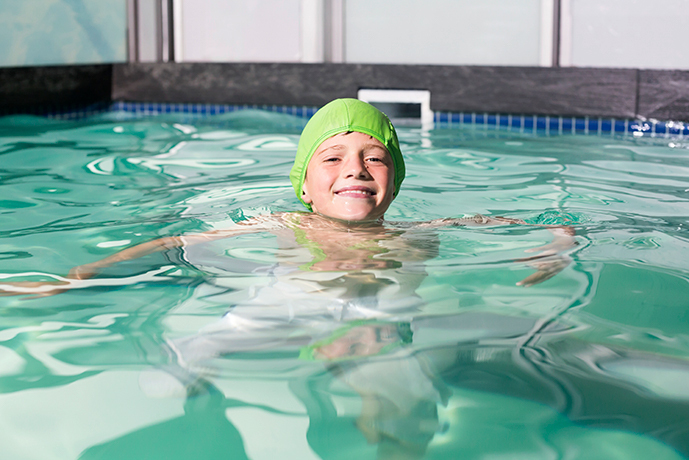 Remember to always practice in a safe area with supervision by a lifeguard or experienced swimmer. And don’t forget to take your time and enjoy the process! 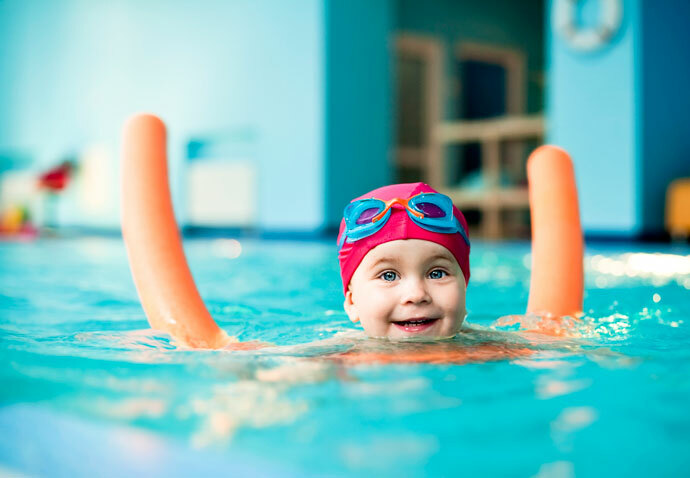 It is helpful for those children to know these swimming techniques, especially so that they will be able to swim in case of emergency to save their life. It’s great that it was being added to the subjects for the kids. I am so nervous of the water and am trying to do breaststroke but find that my legs are floating too much and coming on top of the water. Because of this, I feel that I am going to tip up. I don’t mind my face in the water, and I know how to swim but cannot find the courage to relax while swimming on my front. I can do backstroke after a fashion. The following article contains a few tips to become more comfortable in the water. I’m level 6, and obviously, I can swim fine. I was at level 6 in 4th grade but then I went to a new school, and they put me in level 6 again. Although I can swim fine, I am uncoordinated. I love the ocean too but how do I swim properly without looking uncoordinated? I myself don’t know how to swim and my 9-year-old son wants to learn swimming, can we do it by ourselves? Can you please guide us how to begin? I think it is best that you find someone who can already swim to teach your son. Otherwise, if you try do it by yourself, but cannot swim, how can you help your son if he panics or gets distressed? Another option would be that you learn to swim first and then once you can swim with confidence, you can start teaching your child. Please, I would like to know what kind of equipment would be useful to have when you are a beginner. The most important equipment is a good pair of swim goggles. Short blade swimming fins can also help, and depending on your circumstances a swim snorkel and small swim paddles. You can also have a look at our article covering swimming equipment for beginners. I’m beginning swimming lessons soon for the first time, but have very limited bend in my left knee due to a cyst on my ACL, 30 degrees at most. What would be the best strokes for me to concentrate on? Or will I be able for any? In my opinion, the best swimming stroke to use in your case would be front crawl, as it is possible to swim this stroke with a relaxed two-beat flutter kick of low amplitude. However, being able to swim that way also requires some experience and a good balance. You can also use a pull buoy to further reduce the load on the legs, although it could also become a crutch where you wouldn’t be able to swim well without it. Backstroke could also be an option, as you use the same flutter kick, however backstroke uses a six-beat kick, so you most likely will find that you have to use your legs more than with front crawl. On the other hand, learning backstroke may be easier as you don’t need to roll your body to breathe. The best approach would be to also ask your local swim instructor about his/her opinion, as well as your medical doctor.